Total time: Approximately 15 minutes. 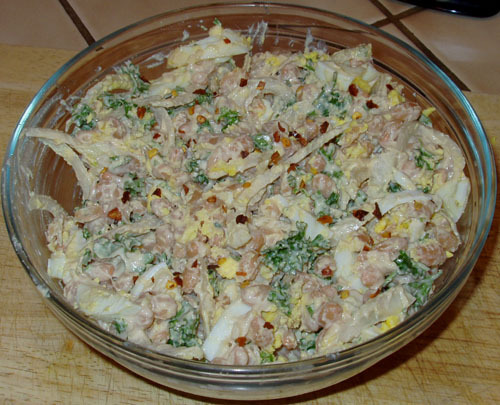 Adapted from Burcu’s Antalya Bean Salad (Antalya Usulü Piyaz) on Almost Turkish Recipes. Mix together dressing ingredients, set aside. In a small bowl, knead onion slices with 1 tsp salt. Rinse and drain. 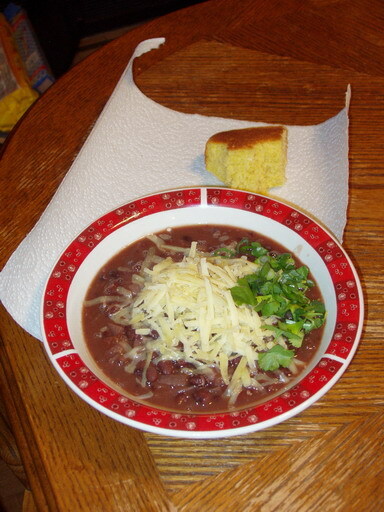 In a medium large bowl, mix together beans and onions. Stir in dressing, coat well. Fold in parsley and eggs. Sprinkle with crushed red peppers. Adapted from Holy Land Brand’s website. Soak the wheat in the hot water until the water is absorbed, about 30 minutes. Drain any excess water, if necessary, and squeeze dry. I normally take this time to chop up all my vegetables. 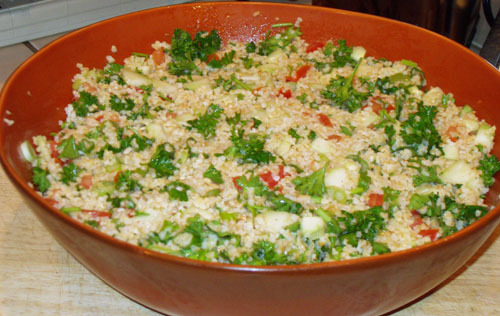 Combine the salad ingredients, including wheat, in a large bowl. Gently stir dressing into the salad. This made a whole lot of salad. We ate it for almost 4 days, with lots of help from friends, in pita bread with other assorted yummies. I’ll definitely be halving this recipe in the future (I don’t think quartering it will work very easily). Total time: 5.5 to 10 hours. It all depends on the size of your crock-pot. I use the larger amounts now because I have a 5 quart Rival crock-pot! 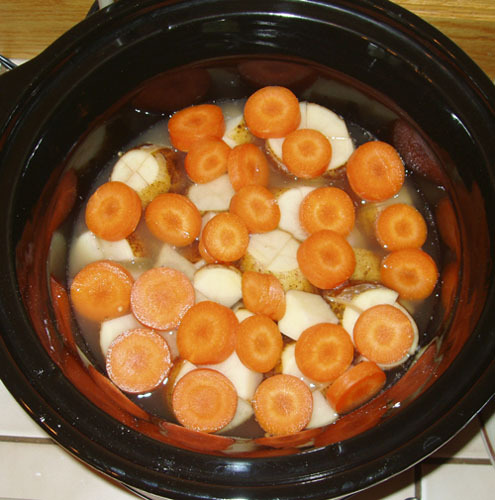 Fill crock-pot with water until just below the vegetables – or to the tops of the vegetables. Cook on high for 1 hour, then simmer for 4 to 6 hours. Alternatively, just let it simmer 8 to 10 hours. Salt to taste just before serving. Caution! Sambal Oelek is HOT HOT HOT! I normally use a normal spoon to dish out my Sambal Oelek, and I use one heaping and a half scoop, which is about the equivalent of 1 tablespoon. That’s about as warm as I like it. Some chili isn’t that hot. Just use caution. I start my crock-pot at 9:30am, and it simmers until 6pm. I don’t use any thickeners, but if you like your stew thick, definitely add some potato or cornstarch just before serving. Total time: 7.5 to 9.5 hours. It’s not just for St. Patrick’s Day! Cabbage is really good for you! The corned beef seasons everything on its own, really. DO NOT ADD SALT. 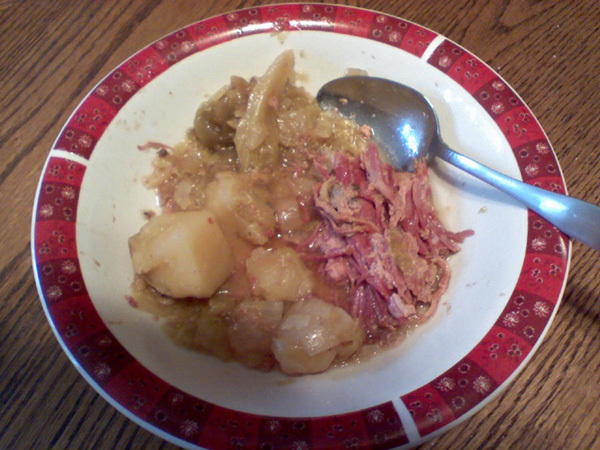 Cut the corned beef into halves. Chop all vegetables down to size (somewhere between a large gumball and your fist, it’s your preference, really). Finished product. Cabbage color shows it's done, and you can see where the water/juice level has risen. Cook on high for 1 hour, then turn to low for 6-8 hours more. 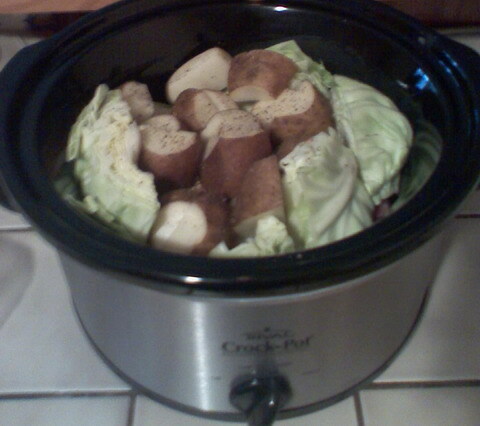 I normally start my crock-pot at 10am, and then turn it down at noon for dinner by 5pm. If I want to eat at 6pm, I turn it down at 11am. Check on it around 2pm and make sure the water level is almost the same height or the exact same height as your vegetables; add more water if necessary. Garnishes add a unique flavor to every bowl. 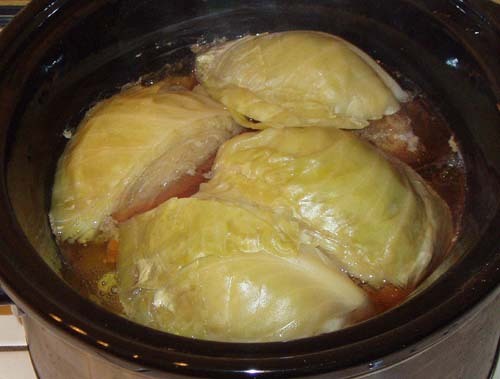 Total time: 1.5 hours on the stove or 4-8 hours in the crockpot. Boil chicken breasts in just enough water to cover them until just cooked. Let cool, but do not drain. Puree tomato, poblanos, garlic, onion, shallot and juice. Chop or shred chicken breasts. Combine chicken, leftover water, tomato mix, chicken broth and seasonings in a pot or crock-pot. Bring just to a boil and simmer for one hour. To prepare your own tortilla strips, slice tortillas in vertical strips 1/4 or 1/2 inch wide. Brown lightly in hot oil, drain on paper towels or in a metal colander. I used my crock-pot, and I cooked it on high from 2pm to 6pm… but I think I could have had the same results in a pot on the stove for an hour. I didn’t puree my vegetables, either. It was more like stew, so next time, I’m definitely pureeing. New Mexico or California chili powder doesn’t add a lot of heat, but it does add a lot of flavor. You can leave them out or substitute cayenne to make it hotter or normal chili powder to change the flavor. Or leave them all out… I’m sure it’ll still taste good. I squeezed in a lime wedge into my own bowl to get the exact taste I was looking for. Some people add corn or black beans. 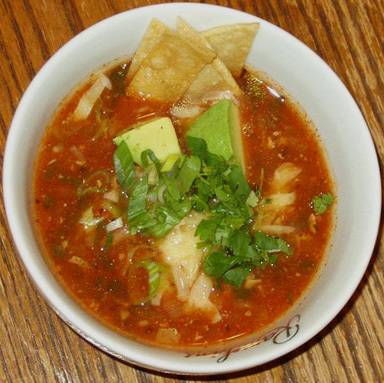 I’m not a fan, as I like my soup to be just chicken and tortillas. Total time: Approximately 4 hours. Generously salt the cabbage and drain in colander for 3 hours. Rinse thoroughly and dry. 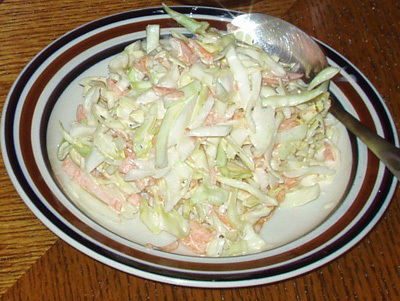 In a separate bowl, combine all of the ingredients except the cabbage and carrot. Whisk to combine evenly. Toss the cabbage and carrot with the dressing. Soak the beans for 12 hours to plump them up. Wash and rinse. Put the beans, onion, tomato, lemon and peppers (cilantro optional) into the crock-pot. Fill crockpot with water until it covers everything. Cook on high for 8-10 hours or until desired tenderness/mushiness. Garnish with leftover cilantro, cheese, sour cream or yogurt, green onions and corn chips. Serves 6-8. We normally serve it with cornbread.